Native bee populations are declining. 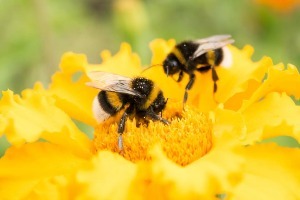 They are being threatened by urbanization and new farming techniques which can both poison the bees and harm their food source. Yet, there are ways that communities and individuals can help the bees. We are harming our native bees. Because of urbanization – the transition from rural to less plant-friendly urban areas – they have less access to their food, nectar. As farmers plant wide expanses of the same crop, there is less plant variety available to bees. Some native bees only use select plants as food, so single-crop farming can leave them hungry. Another problem is the pesticides that farmers use to protect their crops which can harm the bees. All of these pieces add up to the bigger picture: bees need our help. Bees deserve our help, too. They assist in 85 percent of the world's plant reproduction, which includes crops that we depend on. Therefore, they still help us with our food. Helping bees is not only the right thing to do, but it is also logical. Communities and individuals can make a big difference. All bees need nectar to eat and a place to live. The Dane County Environmental Council and UW Extension are already planting bee-friendly gardens around the community. Planting bee-friendly gardens in your backyard or a community space like a park can help bees survive and thrive. A bee-friendly garden is one filled with a variety of native plants, with as few pesticides as possible. Some plants to consider are black-eyed Susans, coneflowers and flowering herbs. There should also be an undisturbed area where native bees can make their homes. These gardens don't have to be big or disruptive, but they can really help. With native bees, which are so vital to plants in danger, it is important for communities to help. If people in urbanized areas help to create places for bees to live and thrive, it can make a big difference. Protecting native bee populations will protect native plants as well as crops, so, therefore, helping them results in helping ourselves. It is important that we help native bees, and it doesn't require much effort to do so.